Finding A Mentor – It Makes A World Of Difference – For kids with type 1, and you! When Joey was diagnosed with type 1 diabetes I never thought much about who he could look up to, we were so busy trying to figure out what we needed to do to keep him healthy. It wasn’t until I joined a parents of type 1 diabetes support group, and found a lot of the topics to be about the kids self esteem after diagnosis, that I thought about counseling or a mentor for Joey. I had found a mentor of sorts for myself, through the social media groups that I joined. In fact I just joined a group for parents with teens! I love it because we can really relate to each other. There is a group for parents of kids that use the Omnipod Insulin pump system, which is a great resource of ideas and information! Another resource I found invaluable is the Omnipod Suite D blog website. There are so many wonderful stories of kids and adults that are living their lives to the fullest, all while inspiring others with type 1 to do the same. I am very proud to be a blogger on the Omnipod site! Shortly after Joey was diagnosed we made the choice of becoming involved in fundraising for a cure. We met other families with kids with type 1, and I thought it was interesting the gambit of how everyone handles this disease. Some were like, out to raise awareness and money for a cure, and some, well not so much! There were those that told you right away that their son/daughter had type 1, then there were those that never spoke about it, at least in the kids presence. It was the elephant in the room! One family comes to mind that didn’t talk about it at all because their son was embarrassed about it and didn’t want anyone to know, . None of his school friends knew, or at least they weren’t told. With type 1 diabetes, the kids look “normal,”on the outside, so it’s easy to hide but hiding it carries a huge burden. It’s stressful to keep that secret, and my thought is that the more people that know the better, more eyes to watch for odd behavior that can mean a high or low blood sugar. It was when Joey wanted to play football that I realized how important a mentor can be. Joey turned to Jake Byrne, a WI Badger football player that has type 1 diabetes, to try and convince me that it was okay for him to play football. Joey didn’t just find out that a player on the Badger’s football team had type 1, he reached out to him through social media and asked Jake to call me, and he did! He understood that I had legit concerns, like where would Joey wear his pod, which is the device that holds and delivers the insulin to Joey’s body from his Omnipod insulin pump. Through talking and meeting Jake we realized that although playing football wasn’t going to be a cakewalk, , it would be okay. This fall Joey’s going to be a freshman in highschool, playing football. He still has his eye on Jake, who is living and working in Dallas. Jake keeps his body in tip top shape, which inspires Joey! In preparation for highschool football, Joey is working out in the school weight room 4 days a week, knowing that even though he has type 1 diabetes, he can look and feel great, like his mentor Jake. I have to remember that what I do and say has a huge affect on Joey. He went on 8th grade retreat, where he wrote me a letter. Part of the letter talked about type 1 and how proud of me he was for being involved with the American Diabetes Association and for raising money to find a cure. However, he also wrote that he doesn’t like to hear the details of when kids die from type 1, whether it be at onset or afterwards. He said he wants to focus on the positive, and although he understands why I tell him some of the tragedies, that he gets it. So, I learned something from Joey! As fate would have it, Joey became a mentor himself for many kids through his work as the Youth Ambassador for the WI American Diabetes Association. He spoke to kids who needed someone to look up to. I heard from a lot of adults who admired Joey for his willingness to speak about type 1 diabetes to their kids. His message was not to be embarrassed about type 1, but to embrace it and live your life to the fullest. Joey isn’t embarrassed to show his coaches how his Omnipod works. He knows that once they know about it they’ll have his back if a situation comes up. And fortunately, we have a great team sports trainer onsite for every practice and game. As a parent fear can be my worst enemy, but I remember what Jake told me, “don’t tell Joey that he can’t do something because of type 1 diabetes!” Instead, teach him what he needs to know to conquer anything that might come his way! Joey’s mentor came by way of his love for football, but there are mentors in every profession, scientists, race car drivers, snowboarders, basketball and football players, and musicians! I recommend finding someone who your child can relate to, show them that they too can do whatever they want with their lives! One last note about Joey’s mentor Jake Byrne. 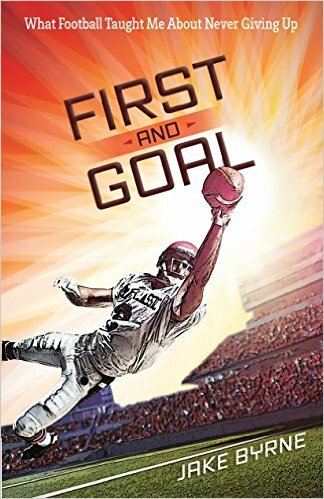 He wrote a book called: “First and Goal: What Football Taught Me About Life.” It’s available to purchase at http://www.amazon.com We have it, and it’s truly a beautifuly written devotional about Jake’s life, the obstacles he had to face and how he overcame them. He even wrote a devotional about our Joey, it’s on page 64, please support Jake’s book, it’s a great gift for the special person in your life that has type 1 diabetes. Jake also has a blog: http://typewon.net.